The 24-year-old woman is unemployed, according to online jail records. California police have arrested a woman they say is responsible for attacking a McDonald's manager over ketchup last month. Santa Ana resident Mayra Gallo, 24, was arrested without incident on Tuesday, the Santa Ana Police Department announced. She was still in custody at the Orange County jail Wednesday on $15,000 bond, and her initial court appearance was scheduled for Thursday, online jail records showed. Gallo's occupation on the jail records was listed as unemployed. 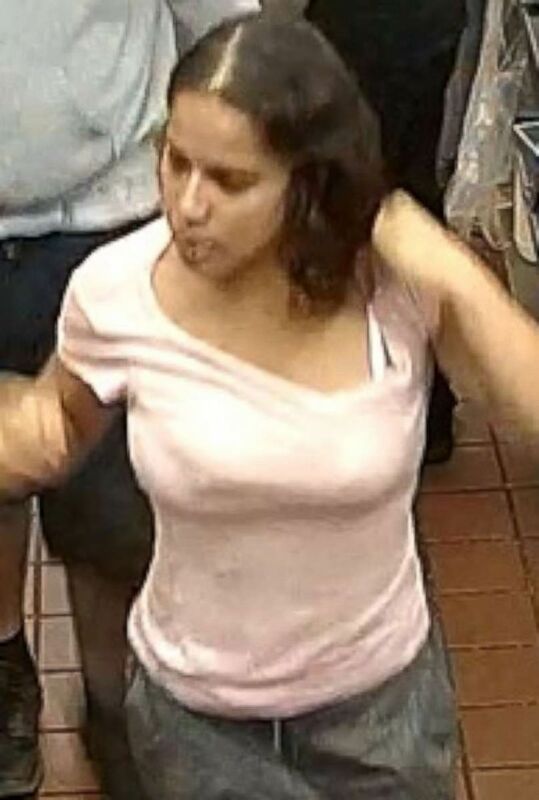 (Santa Ana Police Department) Police in California are seeking the public's assistance to find a woman accused of attacking a McDonald's employee in Santa Ana, Calif., Oct. 27, 2018, at about 11 p.m.
On Oct. 27, Gallo was allegedly seen on camera choking and slamming the fast food manager's head against the soda machine in the kitchen area, according to police. The attack, caught on surveillance video, began when Gallo allegedly walked through the back door of the restaurant around 11 p.m. asking for ketchup, police said in a statement. When the manager told Gallo she could not be in the building, Gallo "became combative" and pushed and choked the employee, police said. The manager told the suspect that she would be "glad" to help her if she went around to the front of the store, Santa Ana Police Cpl. Anthony Bertagna told ABC Los Angeles station KABC earlier this month. (Santa Ana Police Department) Santa Ana, California, resident Mayra Berenice Gallo, 24, was arrested for allegedly assaulted a McDonald's employee on Oct. 27. Other employees were seen rushing to help pull the suspect off the manager. A man wearing a grey shirt and hoodie then escorted the suspect from the restaurant through the back door after an employee alerted him, the video showed. Larry Kaplan, the owner-operator of the Santa Ana McDonald's, told KABC the "biggest priority" is the safety and well-being of the employees and customers. ABC News' Bopha Phorn contributed to this report.